This entry was posted in Community, Events, Students and tagged best, robotics on December 3, 2013 by Wire Eagle. AUBURN UNIVERSITY – The public will have an opportunity to witness firsthand the enthusiastic, sports-like environment surrounding the final competition of the BEST Robotics Program as the 2013 South’s BEST championship takes place on the Auburn University campus in Auburn Arena, Saturday and Sunday, Dec. 7-8. Hours for the free, public event are 10 a.m.-8:30 p.m. Saturday and 9:30 a.m.-5 p.m. Sunday. Answering the nation’s need for more and better-prepared workers in scientific, industrial and technological fields, BEST, which stands for “Boosting Engineering, Science and Technology,” is a middle school and high school robotics program, now in its 21st year nationally and 13th year in Alabama, that is available to all schools at no cost. This entry was posted in Campus Announcement, Community, Events and tagged best on November 29, 2012 by Wire Eagle. AUBURN UNIVERSITY – The public will have an opportunity to witness firsthand the enthusiastic, sports-like environment surrounding the final competition of BEST, the Boosting Engineering, Science and Technology robotics program, as one of the 2012 regional championships takes place on the Auburn University campus in the Auburn Arena on Dec. 1-2. Matches begin at 5 p.m. Saturday, Dec. 1, and the competition will continue on Sunday, Dec. 2, beginning at 9:30 a.m. The event will conclude by 5 p.m. Sunday. Answering the nation’s need for more and better-prepared workers in scientific, industrial and technological fields, BEST is a middle school and high school robotics program, now in its 20th year nationally and 12th year in Alabama, that is available to all schools at no cost. The not-for-profit, all-volunteer program challenges students to design and build a robot to use in a six-week-long series of competitions, culminating in a regional championship. 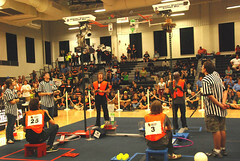 This entry was posted in Events, Students and tagged best, robotics on October 17, 2012 by Wire Eagle. AUBURN UNIVERSITY – Five middle and high school robotics teams captured top honors in the War Eagle BEST robotics competition Saturday, Oct. 13, at Smiths Station High School and will advance to the South’s BEST regional competition in Auburn in December. Columbus Consortium of Columbus, Ga., won first place in the head-to-head competition among 25 teams, followed by Stanhope Elmore High School of Millbrook at second, Wetumpka High School third and Saint James School of Montgomery fourth. This entry was posted in Campus Announcement, Events, Students and tagged best, cosam, engineering, math, science on October 28, 2010 by Wire Eagle. AUBURN – On Saturday, Oct. 30, from 11 a.m. to 5 p.m. at the Auburn University Student Activities Center, teams from 19 local middle and high schools participating in the 2010 War Eagle BEST Competition will put the robots they’ve been working on for the past six weeks to the test. For driving directions, go to www.wareaglebest.org. War Eagle BEST is based at Auburn University and co-sponsored by the Samuel Ginn College of Engineering and College of Sciences and Mathematics. Six weeks ago, the teams received their kits of standardized parts and were given the details of this year’s game – “Total Recall” – that challenges them to design robots that can successfully process and package a manufactured product while ensuring the highest standards of quality. Since then, the students have designed and built robots for Saturday’s head-to-head competition. A second portion of the competition will test the team’s ability to market their creations using presentations, notebooks, displays, t-shirt designs and spirit. This entry was posted in Community, Events and tagged best, engineering, robotics on December 7, 2009 by Wire Eagle. AUBURN – Auburn University will host the South’s BEST regional robotics championship on Saturday, Dec. 12, from 9 a.m. to 6 p.m. at Beard-Eaves-Memorial Coliseum. Gov. Bob Riley will speak at 11:30 a.m. about BEST and its role in K-12 science, technology, engineering and mathematics education and in workforce development in Alabama. BEST, or Boosting Engineering, Science and Technology, is a nationwide middle and high school robotics competition designed to engage and excite students about engineering, science and technology and to inspire them to pursue careers in these fields. This entry was posted in Community, Events and tagged best, engineering on October 16, 2009 by Wire Eagle. AUBURN – A crowd of cheering onlookers packed Auburn University’s Student Activities Center recently to see the 2009 War Eagle BEST Robotics competition. Twenty-four Alabama middle and high school teams showed how they had met this year’s challenge to design a robot to help with today’s energy crisis. Six weeks prior to the competition in Auburn, the teams received their kits of standardized parts and were given the details of this year’s game, “High Octane,” a challenge to design robots to collect and employ common molecules, CO2 and H2O, and essential resources to complete a series of chemical reactions to maximize production of the alternative fuels.